Today's date, November 11, or 11:11 brings to our attention a synchronistic anomaly known as the 11:11 phenomenon. Long known or experienced by many people, it is also something not always talked about. The 11:11 digital time code phenomenon is the term generally used to describe the experience of noticing, seemingly by chance, the digits 11:11 on digital time pieces, time and temperature signs, and so on. Some people report having had this experience so often that it begins to feel like it "means something". Numerologists believe that events linked to the time 11:11 appear more often than chance, or coincidence. This belief is related to the concept of synchronicity and the idea that nothing is simply random, or chance, and view it as an auspicious sign that signals an omniscient presence or event. There are many who believe that just like a computer, whose entire programing is based on just two digits "0" and "1", and increasingly complex variations of their patternings, that our own perceived reality is also ordered by mathematical probabilities of numeric codes. There are, in fact people who believe that human DNA, our genetic memory, is encoded to be triggered by digital codes at specific times and frequencies. And that these codes awaken the mind to the change and evolution of consciousness. And so, to many, 11:11 is one of those codes, meaning activation of our DNA. So, what does it mean if you were born on 11/11 or at 11:11? Obviously, there is a strong symbolic meaning and referencing in your lifetime, not only to these numbers and their occurrences, but to the deep and symbolic. In mathematics, 11 is a double digit. It is therefore considered a Master or Power Number. In Numerology, 11 represents impractical idealism, being visionary, having to do with intuition, revelation, and artistic and inventive genius. Eleven is considered the higher octave of the number two (1 + 1). It carries psychic vibrations and has an equal balance of masculine and feminine properties. Because eleven contains many gifts such as psychic awareness and a keen sense of sensitivity, it also has negative effects such as treachery and betrayal from secret enemies. For those who are superstitious, many associate 11:11 with a wake-up code or an alarm as they see it on digit clocks and watches. It can also be seen as a key to unlock the subconscious mind, our genetic encoded memories, 11:11 or derivatives of these numbers, 111 and 11, are digits that repeat in time and thus are symbolic and a metaphor for reality as patterns that repeat in time for us to experience. This can refer to the rise and fall of civilizations, our personal experiences and lessons, loops in time. For as long as I can remember, members of my families, both in Juneau and in Salem, have glanced casually at clocks and found it to be 11:11 over and over...sometimes multiple days in a row, with ironic precision. My children grew up with a fascination with this phenomenon ...I don't know who started it or how we knew it...that you made a wish every time you realized that it was 11:11. It was right along with blowing on dandelion fluff and making a wish on them, as well. You will note that seeing 11:11 frequently creates synchronicity in your own life. so, if for no other reason than this, see if anything with the 11:11 pattern shows up in your life. 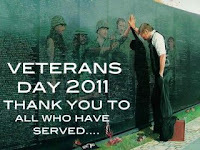 For starters, today is Veteran's Day, November 11th. You'll have to admit that it is a strange co-incidence that major hostilities of World War I were formally ended at the 11th hour of the 11th day of the 11th month of 1918 with the German signing of the Armistice. Just a numerical coincidence? Maybe. And that Mayan calendar that reportedly ends on December 21 in the year 2012. You guess it, it ends at 11:11. Another odd, centuries old, numerical coincidence? Maybe. But today is about more than time code phenomenons, it is more than about quilting or having fun or celebrating all of our made up fun. In the U.S. we celebrate Veterans Day. Veterans Day wasn’t always “Veterans Day.” It used to be called Armistice Day. All around the globe, people embraced the tradition of pausing for two minutes of silence at 11 a.m. on Armistice Day, or as we now call it, "Veteran's Day." So, today on 11:11 at 11 a.m. or perhaps even 11:11 a.m. ..do take a minute, no...take two minutes and "Think" and "Be" Peace. We honor and remember the sacrifices of others on this holi-day (derivation from holy day) but we practice all that we believe in for the good of all. And while we are being peace and peaceful and honoring those who have served, it would be a lovely time to make a patriotic project. My father and 4 of this brothers all served in WWII as proud members of a 'Five Star Family.' Five members went to war, but only four came home again. We lost my dad's 21 year old brother who died taking over the wheel of an airplane and saving the crew after an air strike in the Pacific. The pilot, and my uncle, the co-pilot died, but the crew was rescued by a passing ship three days later. It took years of pain and intense family healing over his loss, accepting that other nations as having families with losses just as their own. I was proud of my father, near the end of his own life, when he finally realized this and I was doubly proud to make patriotic quilts for my dad and one of my uncles. I have made over 50 quilts of valor for veterans' hospitals, funerals, nursing homes, and a local veterans drop in center. And it has been a labor of love and of healing as I stitched with love and the intention of manifesting forgiveness and peace. 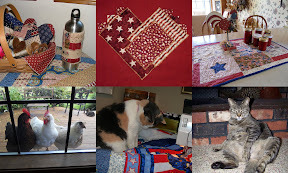 Please check my every growing and so fantastic list of quilting and sewing projects!!! If you take the last 2 digits of the year you were born ...plus the age you will be this year.... and it WILL EQUAL 111....try it for everyone in your family. Isn't that the most fun! Think peace, quilt peace, be peace and remember the magic of timelessness! of quilting and sewing projects!!! Fascinating post, gives me lots to think about today as I pray for the health and safe return of our military, and for those on the road on this three day holiday. First a humble correction: The Titanic sank on 15 April 1912, not December 12. Second, I don't remember when it started, but in our family when we notice it is 11:11 (or any time that is similar, ie. 10:10 or 2:22) we say it is time to kiss somebody! And it is amazing how often we notice those times of the day. Oops, Roxy...so much for my old quote from Wikipedia. I will blow you a virtual dandelion puff kiss at 11:11 today! Well, this is one fascinating post with LOTS to think about. I never knew any of this before, but I will be super aware now whenever I glance at the clock! Prayers for peace, Michele, thank you. We call it "Remembrance Day" and pause for a minute's silence at 11am, but generally it goes by almost unnoticed, just another working day (or, occasionally, as will be the case next year, a weekend). Very interesting post, as always, I love the details. I'm a sucker for history and you always fascinate. FIL-Pop used to call it remembrance day as well. I heard so many people yesterday that were astonished that the banks were closed and there was no mail. 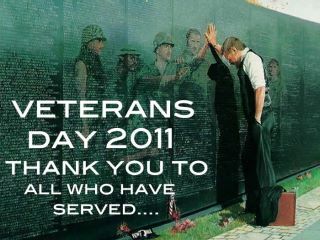 Not a lot of respect or patience for one day of thought given over to people whos lives are forever changed by war. Shame.